Ann Eliza Heathman was born in Southington Ohio in 1851. She apparently showed signs of being a medium at a young age and was encouraged by her family in that regard. Spiritualism had just been born in 1848 and it was sweeping the nation. The Fox Sisters and the Davenport Brothers were touring with their respective spiritualistic shows. It seemed logical for Ann to move in this direction as well. She met a man named H. Melville Fay who was a fake medium who became her manager and some think he was the one who taught Ann the methods of the fake mediums. FAY, by the way was also a fake name, he likely appropriated it from William Fay who was touring with the Davenport Brothers. Ann adopted the stage name of Annie Fay and began to perform as a stage medium. David Price's book, A Pictorial History of Magic says that she may have started performing as early as age 11. So that would be around 1862 that she began. The early act consisted of Mr. Alexander Fay (another name used by H. Melville Fay) who did magic and ventriloquism. Her act followed with a 'Light Seance and a Dark Seance'. The Light Seance is probably where she presented the 'dancing spirit handkerchief'. This is the same trick that Harry Blackstone Sr. made famous, but it's generally agreed that it was invented by Anna Eva Fay. Though, it's not likely her routine was the same as Blackstone's. The Dark Seance was her version of the Davenport's Spirit Cabinet. She would be tied to a post using strips of cloth. The knots in the cloth were then sewed together with thread. Rope would be tied to her feet and then the rope would extend outside her cabinet and be held by members of the audience. Her 'cabinet' by the way was not a cabinet at all, but instead was a pipe and drape set up to form a small curtained room. When the front curtain was closed, odd manifestations would occur, but every time the curtain was opened, Ann was found to be still tied and still in a trance-like state. The manifestations she offered were unique. Her head would be seen floating above the top edge of the curtain at one point; nails and a board were put into the cabinet and moments later the nails would be found to have been pounded into the board; a sheet of paper and a pair of scissors were put into the cabinet and when opened the paper was cut into the shape of a string of dolls. So amazing and believable was Annie Fay that regardless of the inclusion of magic and ventriloquism people began to believe her work was the real thing. I should point out that she never presented her offerings and legitimate spirit manifestations. However, the statement or disclaimer made prior to her performance left a lot to the imagination. It basically said, 'if you think what you are seeing is real, you are welcome to think that. We present these demonstrations of your kind consideration'. That's a simplified version of the quote, and it hardly says what she is doing is fake, but it also makes no claim that it's real. I think because she was a 'stage medium' and presented her show in a theatrical setting, it was assumed she was merely a show person. But because people are so quick to believe these pseudo paranormal performers, she became a sensation. After returning from England in the 1870s, Annie Fay became Anna Eva Fay. She and H. Melville Fay, whose real last name was Cummings, had a son, John, in 1877. Young John would assist his mother in the act as he grew older. Another interesting character who once acted as an assistant to the Anna Eva Fay show was Washington Irving Bishop. Sadly, Bishop was a bit of a traitor as he was source behind an exposure article that appeared in the New York Daily Graphic in 1876. He left the show and went off on his own after this. The exposure of the Anna Eva Fay act did nothing to slow down her success. Shortly after her son was born, H. Melville Cummings/Fay, her manager and possibly her husband, died. She then married David Pingree who then became her manager as well. Over the years the spirit manifestation part of the act began to loose appeal and it was replaced with Anna Eva Fay presenting feats of mentalism or mind reading. In the past, parts of her act were taken by other performers, specifically the spirit handkerchief or dancing hank which ended up in the acts of, Harry Kellar, Frederick Eugene Powell, Harry Blackstone and others. Now it was her turn to 'borrow' from another performer. She took Samri Baldwin's Q&A routine and added it to her act. The Anna Eva Fay version of the Question & Answer Act started with pads of paper being passed out before the show to audience members who wrote down questions on the paper and then tore the paper off and kept it. Later in the show, Anna would sit in a chair and be covered with a light cloth and begin to answer the questions briskly that people had written down. Near the end of the act, the cloth covering would be removed and Anna Eva Fay would collapse in the arms of her husband. 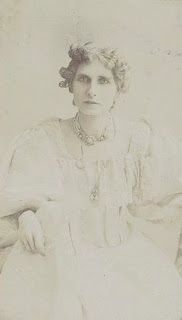 Everything seemed to be splendidly for Anna Eva Fay until her son John married a woman named Eva Norman in 1898. Eva and Anna Eva Fay did not get along from the start and what made matters worse is when Eva and John went off on their own and started doing an act called 'The Marvelous Fays. They were basically doing a copy of Anna Eva Fay's act. 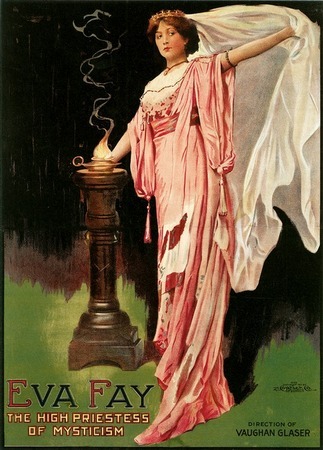 Later Eva Fay would bill herself as 'The High Priestess of Mysticism'. This caused a rift in the family. It was not an exact copy, as Eva Fay presented her version on the Q&A act much differently and more flamboyantly than the elder Fay. In 1908, while apparently cleaning or toying with a loaded pistol, John Cummings Fay, son of Anna Eva Fay and husband to Eva Fay accidentally shot and killed himself. John was buried in the family plot in Massachusetts. Anna Eva Fay continued to perform her act until 1924 when she retired. It was during this time that none other than Harry Houdini stepped into the picture. He had exposed her act in his book A Magician Among the Spirits, and was actually meeting her after the book had come out. Houdini claimed that Fay revealed her secrets to him, but some historians believe that this probably did not happen. I'm not sure that the revelation that she was not a real spirit medium would be a real revelation to Houdini given the nature of Anna Eva Fay's act and Houdini's knowledge of escapes and magic. There was one thing she did reveal to Houdini. According to the Kenneth Silverman's biography on Houdini, Anna Eva Fay confided in Houdini that she visited her son's grave often, always hoping for a message from beyond but never receiving one. Another thing revealed in the Silverman biography was this shocking bit of news, when Houdini went to visit Anna Eva Fay in her home in Mass., he brought along a movie camera to record the event. So here is yet another lost film. Maybe, just maybe it's among the Larry Weeks Collection. 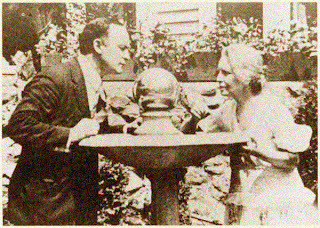 Ms. Fay was also on hand when Houdini was set to challenge Margery the Medium at Symphony Hall in Boston in January 1925. I guess you could say she was there for 'spiritual support' (sorry I couldn't resist that one). Anna Eva Fay Pingree died on May 1927. She was buried in the family plot at the Wyoming Cemetery in Melrose Massachusetts. She was an amazing woman and became quite famous and wealthy with her unusual act. Historian Barry Wiley has written a biography of Anna Eva Fay called, The Indescribable Phenomenon and it's published by Hermetic Press.